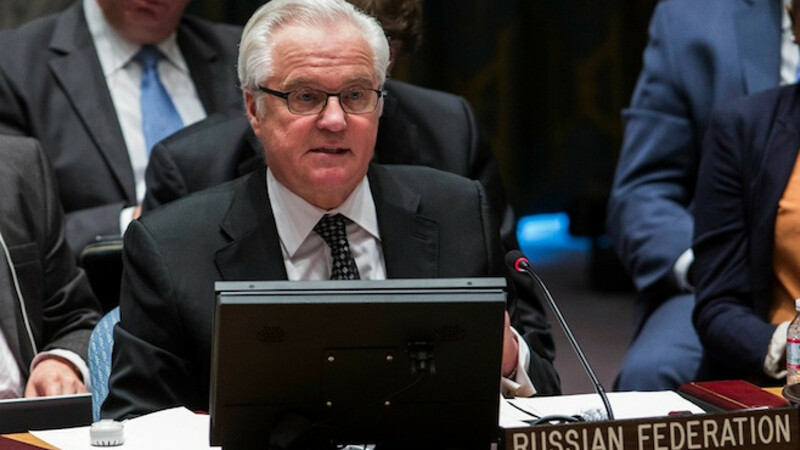 Russia's UN Ambassador Vitaly Churkin. Russia has circulated a draft UN Security Council resolution calling for humanitarian corridors in eastern Ukraine but said Western council members raised so many questions about the text that Moscow would now contemplate what its next move would be. The 15-member council met briefly on Monday behind closed doors to discuss the one-and-a-half page draft resolution, which calls for an end to the worsening violence in southeastern Ukraine and for safe and unhindered humanitarian aid. "There was some positive reactions from some members of the council. However, others were asking so many questions that if we were to try to answer them then we would be talking about things for weeks," Russian UN Ambassador Vitaly Churkin, president of the Security Council for June, told reporters after the meeting. "We have not yet decided what out next move is going to be in terms of working on this resolution," he said. "We must be clear that the crisis in Ukraine is a political security crisis. It's not a humanitarian crisis," British UN Ambassador Mark Lyall Grant told reporters. Lyall Grant and his French counterpart, Gerard Araud, said there were key elements missing from the Russian draft. "There were things missing like the reference to the territorial integrity and sovereignty of Ukraine for instance, the right of Ukraine to defend its territorial integrity," said Araud, adding that a UN report on the humanitarian situation was needed as he was unaware "there was a major crisis." The U.S. called the Russian proposal hypocritical because at the same time armed fighters and weapons were entering Ukraine from Russia, and Russian-backed separatists were attacking new targets and holding hostage monitors from the Organization for Security and Cooperation in Europe, or OSCE. "So if they are going to call for or would support a reduction in tensions and a de-escalation, it would be more effective for them to end those activities," U.S. State Department spokeswoman Jen Psaki said in Washington. Russian Foreign Minister Sergei Lavrov said earlier Monday that Western nations had assured Russia the situation in Ukraine would improve after its May 25 presidential election but that "everything is happening in exactly the opposite way." "People are dying every day. Peaceful civilians are suffering more and more — the army, military aviation and heavy weapons continue to be used against them," Lavrov said. UN Secretary General Ban Ki-moon spoke to newly elected Ukrainian President Petro Poroshenko over the weekend and urged him to initiate a dialogue with Russian President Vladimir Putin, Ban's spokesman Stephane Dujarric said Monday.